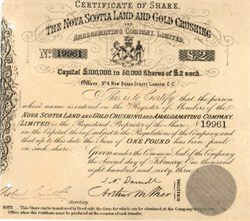 Beautifully engraved SCARCE certificate from the Nova Scotia Land and Gold Crushing issued in 1863. This historic document has an ornate border around it with a vignette of a shield between a horse and a man. This item is hand signed by the Company’s Directors and is over 152 years old. There are probably not many of use who have firsthand accounts of the gold rushes in Nova Scotia, but maybe we can remember stories told by a grandparent, an older relative or perhaps an old prospector. The gold rushes have played a significant role in the history of many towns and villages in the Province and, for many Nova Scotians, gold mining is a distinct part of their heritage. Gold may have been sighted as early as 1578 when the explorer Sir Humphrey Gilbert was given a patent to search for gold and silver in the New World. As well, French settlers may have found gild, as indicated by the village names of Bras d'Or, Cape d'Or or Jeddore (Jet d'Or). However, no ancient workings have been discovered to prove such suspicions. Gold sightings were not referred to again until the 1830s. Labourers building roads in Nova Scotia spoke of a "bright yellow metal in the stone." These first 'discoverers' did not realize their good fortune and actually whittled the gold with their knives during mealtimes! An unidentified captain of the Royal Welsh Fusiliers was said to have panned gold at Gold River in 1840. In 1849, W. Brooks,1 a farmer from Lawrencetown, claimed to have found gold in quartz while repairing a dam on his land but his farther gold him to "drop his nonsense, go on with his work and pitch the rubbish away".2 Eleven years later, gold was discovered by Brooks who had been encouraged by recent discoveries at Tangiers. The area was declared the Lawrencetown gold district! In 1857, unofficial discoveries were made by Richard Smith of Maitland who obtained gold from a river in the Musquodoboit settlement and by John Campbell of Dartmouth who 'assayed' the sands at Fort Clarence in Halifax Harbour (where the oil refinery stands today) and obtained a 'good show' of gold . The first authenticated discovery of gold in quartz was made in 1858 by Captain L'Estrange at Mooseland.1 However, he received no encouragement to continue his efforts. Within two years a farmer from Musquodoboit, John Gerrish Pulsiver, began a search in the same area of Mooseland. One the last Thursday or Friday in May 1860, Pulsiver found gold in a quartz boulder and thus initiated the first gold rush in Nova Scotia. After the declaration of the Mooseland gold district in April 1861, other discoveries along the Eastern Shore were quick to follow in the next half year - Tangier, Lawrencetown, The Ovens, Wine Harbour, Sherbrooke (Goldenville), Waverley, Country Harbour, Isaacs Harbour, Isaacs Harbour and Gold River. Buildings were erected 'overnight' and the miners and their families moved into the new settlements. Most the early claims were staked by people with no knowledge of geology or mining. Those who staked claims in the winter hoped there would be gold nuggets for the picking when the snow had melted. Reality did not meet with their expectations and initial claims were dropped only to be staked by companies that were able, financially and technically, to undertake the work. John Campbell, who had observed gold on the shores of Fort Clarence, ventured to Lunenburg and worked the beach sands at The Ovens with William Cunard, Esq. of steamship line fame.3 Campbell believed the sands of Sable Island contained gold but when he applied for a license, the government offered very confining terms and he was forced to abandon any idea of panning the sands. Gold production increased as a result of the expansion in exploration to new areas located south and west of the Eastern Shore. The highest yield of gold was 27,538 ounces (780 702 g) in 1867. However, poor mining methods, bad management and incompetency led to the decline in production in the early 1870s. By 1874, the output had dwindled to 9,140 ounces (250 119 g). The miners had no means of predicting where additional ore zones could be found and production decreased once the most accessible and richest zones had been worked. get-rich-quick schemes had been the order of the day, money earned had been squandered and no funds remained for further exploration. However, companies that were unable to raise the capital for gold ventures would lease their property for a return payable in gold mined to individuals called tributers. This working relationship between company and the individual tributer was called the tribute system. Although profitable to the single operator, the gold yield remained low. In the late 1890s, the Klondike gold rush, in combination with the opening of the mining camps in Ontario, conjured dreams of 'easy gold ' in the minds of the workers. The result was a movement to the west, with a corresponding decline in gold production in Nova Scotia. The demand for arsenic in the 1920s initiated exploration for arsenopyrite - a mineral associated with the Nova Scotia gold deposits5 - and thus renewed the search for gold . This fact, along with cheap energy costs and an increase in the price of gold (US$20.67 to US$34 per ounce), created an impetus for Nova Scotia's third gold rush. The rush spanned ten years (1932-1942) and 158,000 ounces (4 479 300 g) of gold was produced. Although classified as a base metal operation and therefore termed a god producer rather than a gold district, the Stirling Mine on Cape Breton Island produced between 1952 and 1956 the majority of the gold (at least 95%) from Nova Scotia gold mines. The deposit was discovered about 1895, diamond-drilled from 1916 to 1918, developed during the 1920s and 1930s, recorded an initial gold production of 3,401 ounces (96 418 g) from 1936 to 1938, and produced 13,280 ounces (376 488 g) of gold in total from 1952 to 1956. What may, in time, be considered the fourth gold rush began in 1972. The resurgence of gold exploration was encouraged by the rise in the price of gold (to ~US$820 per ounce!) in the early 1980s. a number of companies staked claim with the idea of working the tailings or old underground mine sites, or prospecting for new leads. Today, the search for gold continues and the future outlook for Nova Scotia gold is optimistic. Nova Scotia Land and Gold Crushing and Amalgamating Company, Pamphlet, Halifax, N.S., (1862).